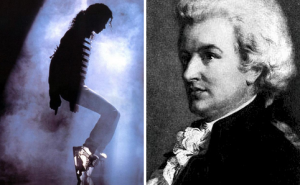 You have likely never considered the similarities between Michael Jackson and Mozart. And given that they were born centuries apart and therefore have completely different musical styles, why *would* you have considered these two virtuosi to be similar? Despite the many years between them, the resemblance between Mozart and Michael Jackson is uncanny. Both were incredibly prolific, died far too young, and are discussed worldwide every day. Why is Mozart the Michael Jackson of 18h Century? Both were the seventh child in their respective musical families. Both had overbearing fathers who wanted more than anything for their youngest sons to be famous. Both worked as touring musicians by age eight. Both dealt with illness throughout their lives. Both were high wage earners but had extravagant spending habits and debt. Both were denied a typical childhood. Both maintained childish dispositions as adults. Both had unique and easily identifiable styles that are second to none. Below are clips from Mozart’s Dies Irae and Michael Jackson’s Thriller. Can you hear the similarities? You’re right, MJ is the Mozart of the 21st century. It’s a great connection, but it’s also depressing. Touring by age 8, sick all their lives, overbearing abusive fathers. I’m glad we have their music but I’m sad for their lives. Completely agreed. No one should have to live like that for fame. Similarities are uncanny, down to their mysterious deaths, possibly by poisoning (propofol is a poison if administered incorrectly), and both victims of envious people.